Abstract: Pancreatic cystic lesions are commonly encountered today with the routine use of cross-sectional imaging modalities such as computed tomography (CT) and magnetic resonance imaging (MRI). The majority of patients discovered to have a pancreatic cyst are completely asymptomatic; yet the presence of such a finding instills fear in the minds of both patient and physician, as the concern for malignant transformation to pancreatic cancer is great despite the relatively low overall likelihood of cyst progression. Not all cysts in the pancreas represent pancreatic cystic neoplasms (PCNs), and not all PCNs have significant malignant potential. Mucinous PCNs are the most concerning, as these lesions have the greatest potential for cancerous transformation to adenocarcinoma. Within the group of mucinous PCNs, intraductal papillary mucinous neoplasms (IPMNs) involving the main pancreatic duct are the most worrisome, and surgical resection should be pursued if the patient has appropriate operative risks. IPMN lesions involving the branch ducts, and mucinous cystadenomas, have a lower likelihood for malignancy, and they may be closely followed for the development of any worrisome or high-risk features. Surveillance of known PCNs is performed with a combination of CT, MRI and endoscopic ultrasound (EUS). EUS-guided fine-needle aspiration (EUS-FNA) may be used to assess cyst fluid cytology, and also to detect cyst fluid amylase level, carcinoembryonic antigen level, and DNA molecular analysis in certain cases. The presence or absence of specific cyst morphological features, as well as the cyst fluid analysis, is what enables the physician to guide the patient towards continued surveillance, versus the pursuit of surgical resection. The diagnosis and management of pancreatic cystic lesions has become an area of developing interest over the past decade. Increasing use of advanced abdominal imaging modalities has resulted in the discovery of previously unrecognized pancreatic cystic neoplasms (PCNs). As these lesions have become a more common finding, health care providers should be familiar with the different types of cystic pancreatic lesions in order to assess the potential for malignancy within a cyst. This allows providers to effectively risk-stratify patients for surveillance, surgery, or expectant management. The purpose of this review is to provide both general practitioners and specialists with evidence-based data to aid in the management of patients found to have PCNs. Pancreatic cysts are classified as either a “true cyst” in which there is a true epithelial lining to the lesion; or a pseudocyst (“false cyst”), in which there is a walled-off collection of fluid without a true epithelial lining, usually the result of acute pancreatitis. PCNs are true pancreatic cysts, and they represent at least 50% of all pancreatic cystic lesions. PCNs are generally divided into four subtypes: mucinous cystic neoplasms (MCNs), intraductal papillary mucinous neoplasms (IPMNs), serous cystadenomas (SCAs), and solid pseudopapillary neoplasms (SPNs) (Table 1).1–3 The MCN and IPMN types are further classified as mucin-producing lesions, while the remainder are non-mucinous.4 Differentiating between the different cyst types can be challenging; however, certain radiographic, histological, and pathological features may help distinguish these cysts from one another, and thus help guide management for the patient. Abbreviations: F, female; IPMN, intraductal papillary mucinous neoplasm; M, male; MCN, mucinous cystic neoplasm; SCA, serous cystadenoma; SPN, solid pseudopapillary neoplasm. SCAs represent roughly 30% of PCNs. They occur more commonly in women, and their peak incidence is in the seventh decade of life. The cyst lining is composed of a simple, glycogen-rich cuboidal epithelium. On imaging, these cysts appear as honeycomb-like microcysts, often with the presence of a “central scar” on computed tomography (CT) or magnetic resonance imaging (MRI). The tiny microcystic spaces may often coalesce, and the lesion can begin to appear as a solid mass-like structure (Figure 1). The most common location is in the body and tail of the pancreas. These lesions are usually benign, with a very low potential for malignant transformation, and thus they are typically managed conservatively unless the patient is symptomatic from the cyst (eg, abdominal pain).3 However, cases of malignant transformation of a serous cystic lesion into a serous cystadenocarcinoma have been reported. In a retrospective review of 158 resection specimens of serous cystic pancreatic lesions from a single institution, one case of histologically confirmed malignancy was identified.5 Also, three of these cases were classified as locally aggressive benign lesions, one of which later developed metachronous metastatic lesions. Additionally, a literature review of serous cystic lesions in 2009 indicated that an average lesion size of 10 cm was associated with carcinoma.6 Therefore, consideration should be made to treat larger and locally advanced lesions aggressively. Figure 1 Endoscopic ultrasound image of a 2.26 cm serous cyst adenoma. Multiple small microcystic spaces coalesce to form a mass-like lesion in the body of the pancreas. Figure 2 (A) Computed tomography scan with an incidentally found mucinous cystadenoma just inferior to the pancreatic duct in the neck of the gland (black arrow). Close inspection of the cysts suggests thick internal septations. (B) Endoscopic ultrasound image of a noncommunicating 1.6 cm mucinous cystadenoma lesion (dotted lines) with septations and macrocystic spaces. Figure 3 (A) Schematic of a main duct IPMN lesion, with diffuse involvement of the duct. (B) Magnetic resonance image of a diffusely involved main duct IPMN lesion. Abbreviation: IPMN, intraductal papillary mucinous neoplasm. Figure 4 (A) Schematic of a branch-duct IPMN lesion arising from a ductal side-branch (appearance of a “bunch of grapes”). (B) Endoscopic retrograde cholangiopancreatography diagnosing a branch-duct IPMN lesion. Pancreatogram reveals a communicating, “bunch of grapes” lesion off the ductal side-branch in the head of the gland (arrow). Definitive diagnosis of an IPMN is made based on the histology of resected cysts. Many BD-IPMNs exhibit some involvement with the main duct microscopically, and therefore grading these lesions in terms of the extent of main duct involvement may be a preferable approach, in contrast to categorizing all IPMNs as strictly MD-IPMN or BD-IPMN.4,9 Distinguishing between these subtypes is important, as MD-IPMNs are at increased risk for malignant transformation compared with BD-IPMNs. The prevalence of malignancy in resected MD-IPMN lesions ranges from 57% to 92%, in contrast with 6%–46% for BD-IPMN lesions.4 Interestingly, on cyst fluid DNA analysis studies of IPMNs, the histological grade of dysplasia increases with the frequency of mutations in the k-ras gene.10 These findings suggest that k-ras gene mutations play a significant role in the process of carcinogenesis for these mucinous PCNs. Figure 5 Endoscopic ultrasound image of a partially solid and partially cystic solid pseudopapillary neoplasm within the tail of the pancreas (dotted lines). The small black space in the center of the lesion is a fluid or cystic component. 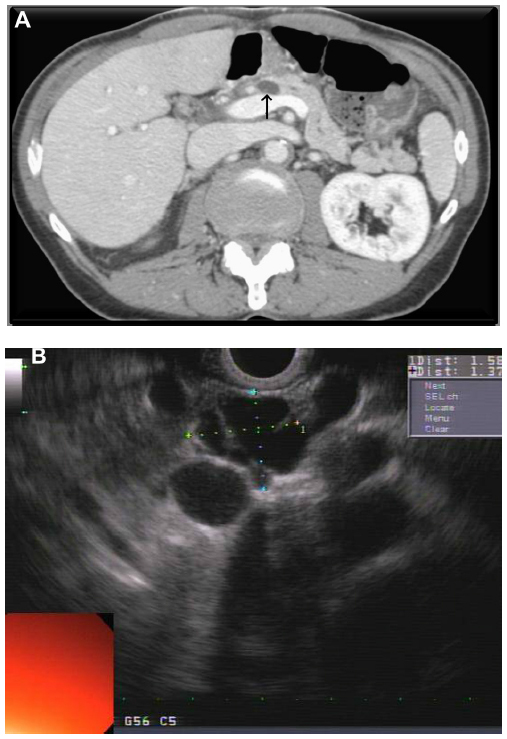 Most pancreatic cysts are asymptomatic at the time of diagnosis, and they are often discovered incidentally when abdominal imaging is performed for evaluation of an unrelated problem. When PCNs are symptomatic, symptoms are typically the result of pancreaticobiliary duct obstruction. As such, clinical findings may include recurrent pancreatitis, chronic abdominal pain, or jaundice. Other nonspecific symptoms which may be present include nausea, vomiting, back pain, weight loss, or anorexia. The symptoms of advanced PCNs with malignant transformation may mimic those caused by pancreatic ductal adenocarcinoma (eg, jaundice, weight loss, and pain). Obstruction of the MPD (typically from mucin due to an IPMN, or compression of the duct by mass effect from the lesion) may present as acute or chronic pancreatitis (Figure 6). Development of exocrine and endocrine pancreatic insufficiency is not uncommon, due to atrophy of the distal gland downstream of the obstruction. Figure 6 (A) Normal major papilla. (B) Major papilla with mucin extruding from the opening; investigated for recurrent acute pancreatitis in this patient. PCNs and small pancreatic pseudocysts are often mistaken for one another given their similar presentations and imaging characteristics. The clinical context is often needed to help differentiate between PCNs and pseudocysts, as the latter are more likely to develop in the setting of prior pancreatitis (either recent or remote past), and are typically associated with pain.3,14 One study investigating 212 patients with pancreatic cystic lesions in a surgical practice showed that 36.7% of the patients were asymptomatic.1 These asymptomatic cysts were more common in the elderly, smaller in size than symptomatic cysts, and less likely to be pseudocysts on final surgical pathology. Furthermore, greater than half of the asymptomatic cysts were found to be PCNs with dysplastic changes or malignant transformation. 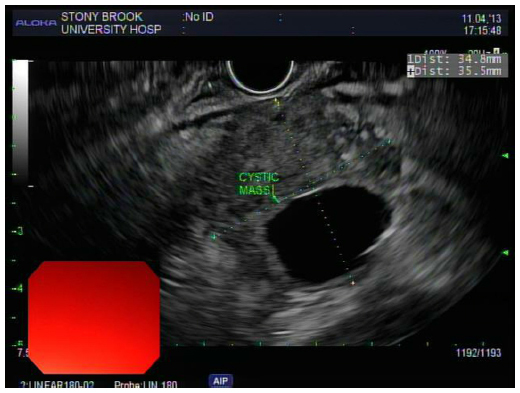 Another recent study followed 105 patients who underwent preoperative endoscopic ultrasound (EUS) for cyst evaluation. In this study, only 10% of patients were asymptomatic. 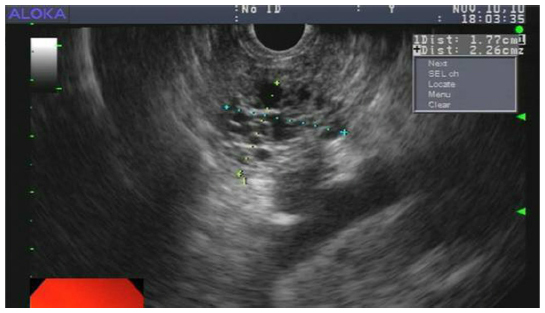 Of the 70 patients with EUS cyst size less than 3 cm, 12 patients (17%) had a malignancy as diagnosed from EUS.15 The above studies support the role for periodic surveillance in all patients with PCNs, regardless of the size of the lesion or presence of symptoms. When further evaluation of a PCN beyond routine cross-sectional imaging is required, EUS with fine-needle aspiration (FNA) may be utilized. EUS-FNA allows for better imaging characterization of cyst morphology (eg, the presence of a mural nodule or a solid component), and it enables aspiration of cyst fluid for further analysis. Despite its unique ability to obtain high quality pancreatic imaging from within the lumen of the upper gastrointestinal tract, previous studies have suggested a limited ability of EUS alone to distinguish between benign and early dysplastic or malignant lesions, especially if features of frank malignancy are not present.3,16 Furthermore, the accurate interpretation of EUS findings is operator dependent and often varies from one endoscopist to another. One study investigated the ability of endosonographers to establish a diagnosis of a PCN, and also to determine the presence or absence of malignancy solely based on the EUS findings.18 Poor to fair agreement was observed between endosonographers in both tasks. Another study evaluated the accuracy of preoperative imaging with CT, endoscopic retrograde cholangiopancreatography (ERCP), or EUS in the detection of invasive versus noninvasive IPMN and MCN lesions.19 The overall accuracy for detecting invasion was less than 80% for all three diagnostic modalities. ERCP enables inspection of the duodenal papilla for mucin extrusion, a finding which occurs in 20%–50% of main duct IPMNs, and is essentially pathognomonic for the disease. In addition, ERCP allows for the ability to perform pancreatography to assess communication of the cyst with the MPD. That said, with today’s high quality (noninvasive) MRCP studies, there is little role for diagnostic ERCP in the work-up of a PCN. Due to the relatively high risk of post-procedural pancreatitis when performing ERCP of the pancreatic duct (20%–30%), this invasive procedure is most often reserved for patients in whom the diagnosis of main duct IPMN is highly suspected, and one is attempting to diagnose frank malignancy within the duct. The combination of intraductal pancreatoscopy with intraductal ultrasound at the time of ERCP can demonstrate malignancy with a high level of precision, and allow for accurate sampling of ductal nodules and other areas of concern.3,4,16 These procedures are generally performed only at specialized centers by expert interventional endoscopists. Compared with ERCP, EUS evaluation with FNA is a less invasive and safer endoscopic procedure for the diagnosis of a PCN. Cyst fluid is obtained to assess for the presence of mucin, cytological atypia, carcinoembryonic antigen (CEA), and amylase levels, and DNA for molecular analysis. Studies have shown varying success in the accurate diagnosis of PCNs using cytology alone. However, identifying certain cell types using FNA can help narrow the diagnosis in certain instances. For example, the finding of glycogen-rich cuboidal cells suggests a diagnosis of SCA in the appropriate clinical setting; or the aspiration of inflammatory cells, such as macrophages and neutrophils, usually is suggestive of a pseudocyst.3,9,16 For the diagnosis of malignancy within PCNs, EUS-FNA with cytology alone is highly specific (approximately 90%); yet, the sensitivity of EUS-FNA for a malignant PCN may be as low as 40%–50%, with high false-negative rates. Abbreviations: CA, carbohydrate antigen; CEA, carcinoembryonic antigen; IPMN, intraductal papillary mucinous neoplasm; MCN, mucinous cystic neoplasm; SCA, serous cystadenoma. Recent developments in DNA molecular analysis of cyst fluid have identified genes potentially associated with certain cyst types or PCNs. This can further help with the diagnosis of PCNs when cytological analysis is unrevealing due to scant cellularity in the cyst fluid, especially when a solid component is not present for sampling. A recent study showed that the presence of a k-ras gene mutation is diagnostic of a mucinous cyst.21 Furthermore, cyst fluid demonstrating large amounts of DNA, high-amplitude mutations, or a mutational sequence of k-ras mutation followed by allelic loss (“loss of heterozygosity”) is highly suspicious for malignancy.9,21 Another recent study demonstrated that GNAS gene mutations were found in 66% of IPMNs, and either GNAS or k-ras mutations were present in 96% of IPMNs.22 Other biomarkers that have been analyzed include micro-ribonucleic acid (miR). In one study, endoscopically acquired pancreatic cystic fluid was obtained from 38 patients who subsequently had surgical resection of the cystic lesion.23 Levels of two specific miRs (miR-21 and miR-221) were found in higher concentrations in the malignant versus benign cystic lesions. Overall, cyst fluid analysis is often times complex. Interpretation of the results can be difficult and variable depending upon the type of lesion, and the amount of fluid able to be aspirated at the time of the EUS procedure. The information obtained from the cyst fluid is used in conjunction with the patient’s clinical presentation, as well as specific cyst-related morphological features on imaging, in order to make an overall assessment in terms of the type of PCN present and its inherent risk of malignancy. With the development of new and emerging molecular markers, cyst fluid analysis is likely to become even more complex in its attempt to risk-stratify specific PCNs. However, in the opinion of these authors, current data do not support the widespread use of molecular analysis in cyst fluid interpretation due to low overall specificity and sensitivity of the tests. For example, a recent study characterized the performance of molecular analysis (DNA) in diagnosing mucinous lesions.24 DNA analysis was performed on cyst fluid and compared with resection specimens. Molecular analysis had a sensitivity of 50% and specificity of 80% in identifying mucinous lesions. Diagnostic performance did increase when combined with CEA and cytology; however, the study clearly shows that currently available molecular analysis studies are insufficient when used alone. In routine clinical practice, we reserve molecular analysis of cyst fluid only for those select patients with “borderline” lesions in which we may be searching for more information to guide a patient toward, or away from, surgical resection (as opposed to continued surveillance). The various diagnostic modalities discussed above can be useful for narrowing down the diagnosis of the exact type of PCN; however, definitive diagnosis is often times difficult without supporting histological evidence (ie, by means of surgical resection). Given this diagnostic challenge, a more practical approach to risk-stratification has been suggested and outlined in a recent paper by Tanaka et al.9 Within this publication, evidence-based guidelines were devised by expert physicians and surgeons of the International Association of Pancreatology (IAP). The guidelines risk-stratify PCNs based on “worrisome features” and “high-risk stigmata” to determine management of these lesions based on their malignant potential. Furthermore, they outline the stepwise use of multiple imaging modalities when further work-up is required in order to determine whether a PCN is appropriate for surgical resection. Abbreviations: IPMN, intraductal papillary mucinous neoplasm; MCN, mucinous cyst adenoma; PCN, pancreatic cystic neoplasm. The following algorithm for risk-stratification and management of PCNs has been proposed: any PCN with features showing “high-risk stigmata” should be considered for surgical resection if no clinical contraindications exist. If “high-risk stigmata” are not present on noninvasive imaging studies, the next step is to assess for “worrisome features.” If “worrisome features” are suggested on CT or MRI, an EUS examination should be performed by an experienced endoscopist to assess for these features, looking specifically for the presence of a mural nodule, MPD abnormalities with gland atrophy, thickened or enhanced portions of the cyst wall, and the presence of undetected regional lymphadenopathy. In addition, EUS-FNA may be performed to obtain cyst fluid for cytological analysis which may be suspicious or positive for malignancy. Based on these findings surgery may be considered. The management of branch duct IPMNs is less clear and depends greatly on the clinical context. The malignant potential of a BD-IPMN is less than MD-IPMN, with a mean frequency of malignancy of 25.5%, and a mean frequency of invasive cancer of 17.7%.9 Sugiyama et al showed the two strongest predictors of malignancy in BD-IPMN lesions are the presence of a mural nodule and cyst size >30 mm.4,25 Furthermore, Matsumoto et al demonstrated that BD-IPMNs with size <30 mm and the absence of mural nodules are highly unlikely to be malignant.27 These patients were followed for 33 months, and the majority remained asymptomatic without progression to advanced disease. In addition to size and the presence of mural nodules, a rapid rate of cyst growth is another high-risk factor.4,9 One study investigated BD-IPMNs <30 mm and without mural nodules.28 During follow-up, 17.4% of the patients underwent resection, and the malignant cysts had grown by a greater percentage (69.8% versus 19.4%), and at a greater rate (4.1 mm versus 1.0 mm per year), when compared with the nonmalignant cysts. Overall, a cyst growth rate of more than 2 mm/year was associated with a higher risk of malignancy.28 In addition, high-grade cellular atypia on EUS-FNA results, as opposed to “positive cytology,” was also found to be a high-risk factor for malignancy in BD-IPMNs.9 The results of these studies and many others are the basis for the algorithmic guidelines suggested by Tanaka et al in regards to the management of BD-IPMN lesions.4,9 Given the lower risk for malignancy when compared with MD-IPMN lesions, conservative management with periodic surveillance is reasonable, particularly in older patients and those without worrisome features. Recent studies have examined nonsurgical methods for treating PCNs. EUS-guided mucosal ablation by ethanol injection into the cyst cavity is a novel technique that has been recently investigated. Ethanol induces cell membrane lysis and protein denaturation, which results in coagulative necrosis. Typical candidates for this investigative approach have been patients who are poor surgical candidates with worrisome-appearing cysts that lack communication with the MPD (so as not to inject alcohol directly into the pancreatic ductal system). The initial pilot study performed by Gan et al31 showed that ethanol ablation is safe and feasible, and a subset of patients (8 of 23 on follow-up) underwent complete resolution of the cyst. A follow-up study by DeWitt et al32 showed that EUS-guided ethanol lavage resulted in a greater decrease in cyst size compared with saline lavage. Follow-up using CT surveillance revealed no cyst recurrence for a median of 26 months, and the percentage of complete pancreatic cyst ablation was 33%. Studies have also investigated EUS-guided ethanol ablation followed by local injection of paclitaxel.33 Overall, these findings are promising and may present an alternative therapy for patients unwilling or unfit for surgery. However, it should be noted that complications such as pain and pancreatitis are relatively common. More research at high-volume centers is needed before EUS-guided ethanol ablation can be recommended to patients over surgical resection. Several studies have investigated current trends in the evaluation and management of PCNs among physicians. In one recent study, a comparison of practice habits and awareness of consensus guidelines was examined between general gastroenterologists and surgeons, and a specialist group of EUS experts.34 Awareness of the existence of published guidelines for the diagnosis and management of PCNs was less common in the general group than the specialist group (64% versus 33% unaware, respectively). The American Society for Gastrointestinal Endoscopy guidelines were more commonly recognized by both groups, rather than the IAP guidelines. Both groups demonstrated only moderate consistency employing the published recommendations into their clinical practice. Interval surveillance imaging after IPMN resection is strongly recommended, as multifocal disease is common and additional lesions may develop in the remnant pancreas. Recurrence rates of new IPMN lesions following resection range from 0%–20%.4,9,35 In patients with noninvasive disease that was completely resected, at least an annual examination of the remnant pancreas with MRI or EUS is encouraged. However, the risk of developing invasive disease in another IPMN lesion within the gland appears to be very low.35 Surveillance for invasive IPMNs after resection should mimic follow-up guidelines for pancreatic ductal adenocarcinoma. For MCNs, given the nearly 100% cure rate following resection of noninvasive lesions, continued surveillance is unnecessary in most cases. Malignant MCNs should be followed frequently at 6–12 month intervals with either CT or MRI.4,9 Data for surveillance guidelines for the other PCN types is limited, and surveillance should be considered on an individual basis. The increasing discovery of PCNs is largely due to the widespread use of new, cross-sectional imaging techniques. Physicians and surgeons need to be aware of the different types of pancreatic cysts so that a determination may be made regarding the potential for malignant transformation. Appropriate evaluation of a possible PCN includes a multidisciplinary approach among abdominal radiologists, gastroenterologists with a special expertise in EUS, and pancreatic surgeons. Updated published guidelines exist to help providers recognize higher risk lesions, and provide recommendations in terms of surveillance strategies and the need for possible pancreatic resection. Much is still unknown about PCNs, yet our knowledge on risk-stratification, optimal surveillance intervals, and post-surgical management is rapidly increasing. Fernandez-del Castillo C, Targarona J, Thayer SP, et al. 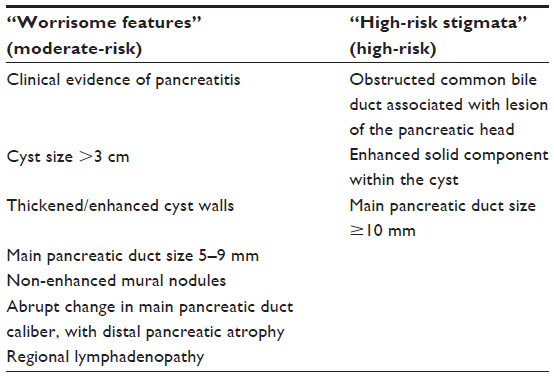 Incidental pancreatic cysts: clinicopathologic characteristics and comparison with symptomatic patients. Arch Surg. 2003;138(4):427–433. Hamilton SR, Aaltonen LA, editors. Pathology and genetics of tumours of the digestive system. In: Vol 2 of World Health Organization Classification of Tumours. Lyon, France: IARC Press; 2000. Brugge WR, Lauwers GY, Sahani D, Fernandez-del Castillo C, Warshaw AL. Cystic neoplasms of the pancreas. N Engl J Med. 2004;351:1218–1226. Tanaka M, Chari S, Adsay V, et al. International consensus guidelines for management of intraductal papillary mucinous neoplasms and mucinous cystic neoplasms of the pancreas. Pancreatology. 2006;6:17–32. Galanis C, Zamani A, Cameron JL, et al. Resected serous cystic neoplasms of the pancreas: A review of 158 patients with recommendations for treatment. J Gastrointest Surg. 2007;11(7):820–826. King JC, Ng TT, White SC, Cortina G, Reber HA, Hines OJ. 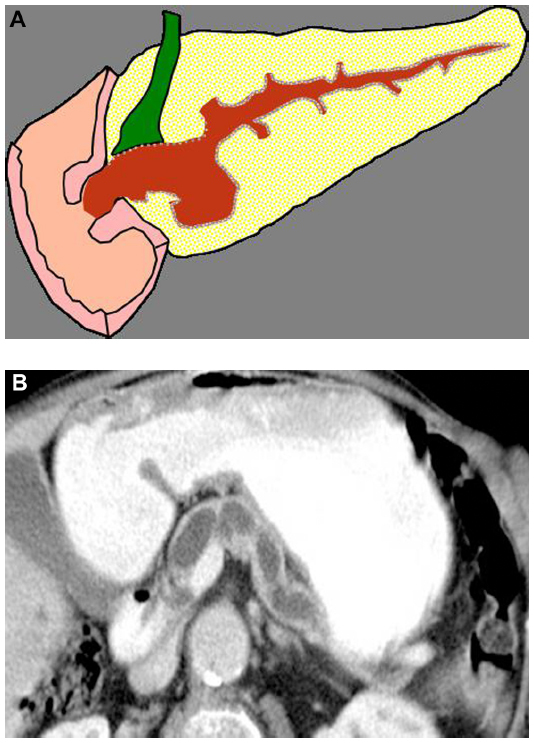 Pancreatic serous cystadenocarcinoma: a case report and review of the literature. J Gastrointest Surg. 2009;13(10):1864–1868. Mohr VH, Vortmeyer AO, Zhuang Z, et al. Histopathology and molecular genetics of multiple cysts and microcystic (serous) adenomas of the pancreas in von Hippel-Lindau patients. Am J Pathol. 2000;157:1615–1621. Vortmeyer AO, Lubensky IA, Fogt F, Linehan WM, Khettry U, Zhuang Z. Allelic deletion and mutation of the von Hippel-Lindau (VHL) tumor suppressor gene in pancreatic microcystic adenomas. Am J Pathol. 1997;151:951–956. Tanaka M, Fernandez-del Castillo C, Adsay V, et al. International consensus guidelines 2012 for the management of IPMN and MCN of the pancreas. Pancreatology. 2012;12:183–197. Z’graggen K, Rivera JA, Compton CC, et al. Prevalence of activating K-ras mutations in the evolutionary stages of neoplasia in intraductal papillary mucinous tumors of the pancreas. Ann Surg. 1997;226:491–498. Ng KH, Tan PH, Thng CH, Ooi LL. Solid pseudopapillary tumour of the pancreas. ANZ J Surg. 2003;73(6):410–415. Ahrendt SA, Komorowski RA, Demeure MJ, Wilson SD, Pitt HA. Cystic pancreatic neuroendocrine tumors: is preoperative diagnosis possible? J Gastrointest Surg. 2002;6:66–74. Buetow PC, Parrino TV, Buck JL, et al. Islet cell tumors of the pancreas: pathologic-imaging correlation among size, necrosis and cysts, calcification, malignant behavior, and functional status. AJR Am J Roentgenol. 1995;165:1175–1179. Bassi C, Procacci C, Zamboni G, et al. Intraductal papillary mucinous tumors of the pancreas. Verona University Pancreatic Team. Int J Pancreatol. 2000;27:181–193. Wong J, Weber J, Centeno BA, et al. High grade dysplasia and adenocarcinoma are frequent in side-branch intraductal papillary mucinous neoplasm measuring less than 3 cm on endoscopic ultrasound. J Gastrointest Surg. 2013;17(1):78–84. Khalid A, Brugge W. ACG practice guidelines for the diagnosis and management of neoplastic pancreatic cysts. Am J Gastroenterol. 2007;102:2339–2349. Waters JA, Schmidt CM, Pinchot JW, et al. CT vs MRCP: optimal classification of IPMN type and extent. J Gastrointest Surg. 2008;12(1):101–109. Ahmad NA, Kochman ML, Brensinger C, et al. Interobserver agreement among endosonographers for the diagnosis of neoplastic versus non-neoplastic pancreatic cystic lesions. Gastrointest Endosc. 2003;58:59–64. Cellier C, Cuillerier E, Palazzo L, et al. Intraductal papillary and mucinous tumors of the pancreas: Accuracy of preoperative computed tomography, endoscopic retrograde pancreatography, and endoscopic ultrasonography, and long-term outcome in a large surgical series. Gastrointest Endosc. 1998;47:42–49. Sperti C, Pasquali C, Guolo P, Polverosi R, Liessi G, Pedrazzoli S. Serum tumor markers and cyst fluid analysis are useful for the diagnosis of pancreatic cystic tumors. Cancer. 1996;78:237–243. Khalid A, Zahid M, Finkelstein SD, et al. Pancreatic cyst fluid DNA analysis in evaluating pancreatic cysts: a report of the PANDA study. Gastrointest Endosc. 2009;69:1095–1102. Wu J, Matthaei H, Maitra A, et al. Recurrent GNAS mutations define an unexpected pathway for pancreatic cyst development. Sci Transl Med. 2011;3(92):92ra66. Farrell JJ, Toste P, Wu N, et al. Endoscopically acquired pancreatic cyst fluid microRNA 21 and 221 are associated with invasive cancer. Am J Gastroenterol. 2013;108(8):1352–1359. Al-Haddad M, Dewitt J, Sherman S, et al. Performance characteristics of molecular (DNA) analysis for the diagnosis of mucinous pancreatic cysts. Gastrointest Endosc. 2014;79(1):79–87. Sugiyama M, Izumisato Y, Abe N, Masaki T, Mori T, Atomi Y. Predictive factors for malignancy in intraductal papillary-mucinous tumors of the pancreas. Br J Surg. 2003;90:1244–1249. Salvia R, Fernandez-del Castillo C, Bassi C, et al. Main duct intraductal papillary mucinous neoplasms of the pancreas: clinical predictors of malignancy and long-term survival following resection. Ann Surg. 2004;239:678–687. Matsumoto T, Aramaki M, Yada K, et al. Optimal management of the branch duct type intraductal papillary mucinous neoplasms of the pancreas. J Clin Gastroenterol. 2003;36:261–265. Kang MJ, Jang JY, Kim SJ, et al. Cyst growth rate predicts malignancy in patients with branch duct intraductal papillary mucinous neoplasms. Clin Gastroenterol Hepatol. 2011;9:87–93. Tseng JF, Warshaw AL, Sahani DV, Lauwers GY, Rattner DW, Fernandez del-Castillo C. Serous cystadenoma of the pancreas: Tumor growth rates and recommendations for treatment. Ann Surg. 2005;242:413–421. Lee SE, Jang JY, Hwang DW, et al. Clinical features and outcome of solid pseudopapillary neoplasm: differences between adults and children. Arch Surg. 2008;143:1218–1221. Gan Sl, Thompson CC, Lauwers GY, Bounds BC, Brugge WR. Ethanol lavage of pancreatic cystic lesions: initial pilot study. Gastrointest Endosc. 2005;61:746–752. DeWitt J, McGreevy K, Schmidt CM, Brugge WR. EUS-guided ethanol versus saline solution lavage for pancreatic cysts: a randomized, double-blind study. Gastrointest Endosc. 2009;70:710–723. Oh HC, Seo DW, Song TJ, et al. Endoscopic ultrasonography-guided ethanol lavage with paclitaxel injection to treat patients with pancreatic cysts. Gastroenterology. 2011;140(1):172–179. Buscaglia JM, Shin EJ, Giday SA, et al. Awareness of guidelines and trends in the management of suspected pancreatic cystic neoplasms: survey results among general gastroenterologists and EUS specialists. Gastrointest Endosc. 2009;69:813–820. Miller JR, Meyer JE, Walters JA, et al. Outcome of the pancreatic remnant following pancreatectomy for non-invasive intraductal papillary mucinous neoplasm. HPB (Oxford). 2011;13(1):759–766.